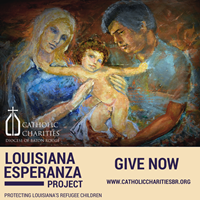 Give now to Louisiana Esperanza – a CCDBR fund to preserve the lives of women, children and migrants honoring the Holy Family’s reminder that we should treat every homeless, wandering family as if it were That Family. 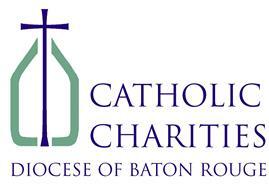 Donate 100% - Add 3% so that 100% of the donation goes to Catholic Charities of the Diocese of Baton Rouge. Catholic Charities of the Diocese of Baton Rouge has partnered with Network for Good to securely process your online credit card payment via Network for Good (tax ID 68-0480736). This transaction will appear on your credit card statement as "Network for Good." This transaction is subject to Network for Good’s Privacy, Security & Disclosure Statement and the Charitable Solicitation Disclosure.